Hey all! 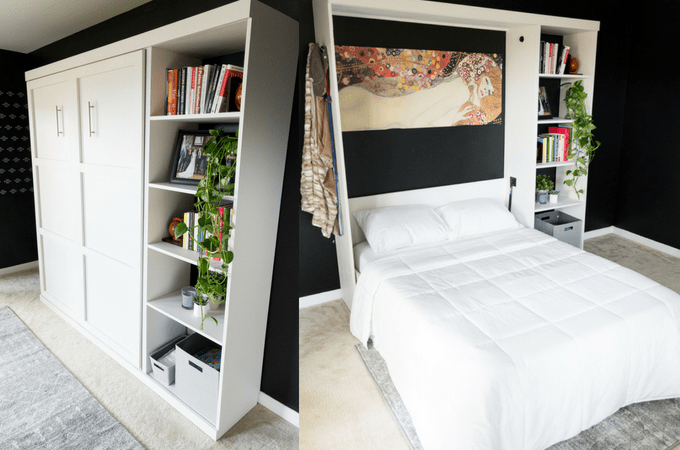 Today I’m sharing my last $100 Room Challenge project, and it’s one I’m pretty excited about. 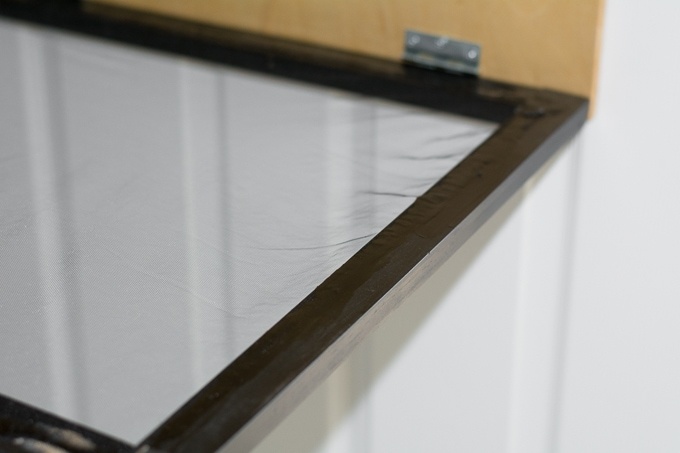 We had a cheap plastic drying rack that could be collapsed for storage, and it was an awesome solution for many years. Then it broke, so I decided to DIY something to replace it. 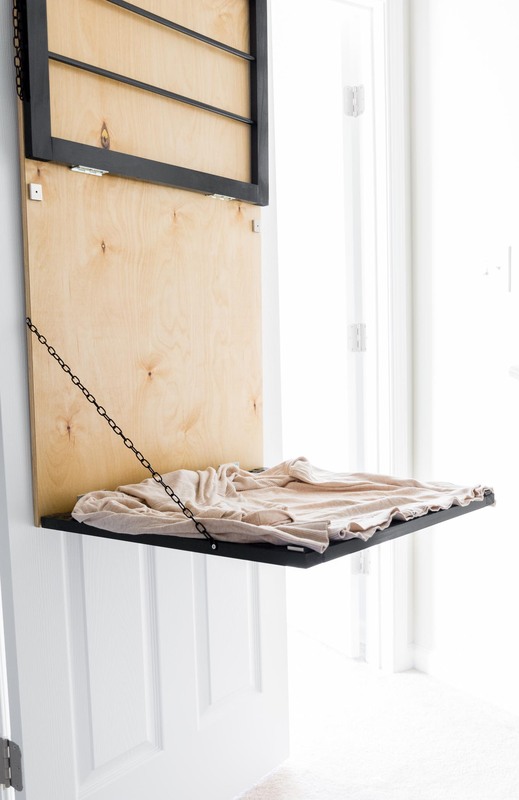 As you know by know, our laundry nook isn’t exactly a room, so I also wanted to make something that I could mount to the back of the laundry door. Oh, and I wanted it to match the light pine/black combo I now have going on in the laundry nook. I know, that’s kind of a scary big supply list, but this project wasn’t actually that difficult. It just too me a while—and admittedly a few trips back and forth to Lowe’s. Step 1: I cut all pieces according to the cut list above. Use medium- and fine-grit sandpaper to polish each piece, paying extra attention to any splintery edges. 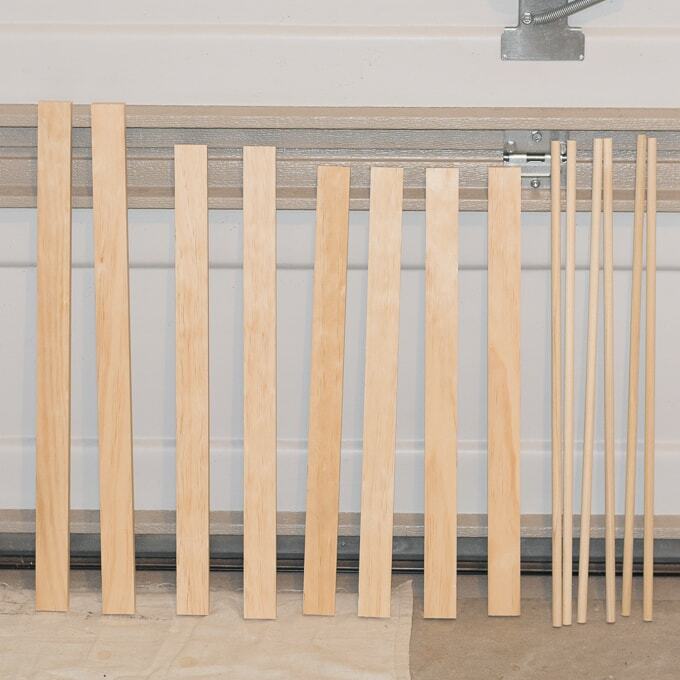 Step 2: Use your tape measure and pencil to make ticks down the 24″ pieces to mark where the dowels will go. 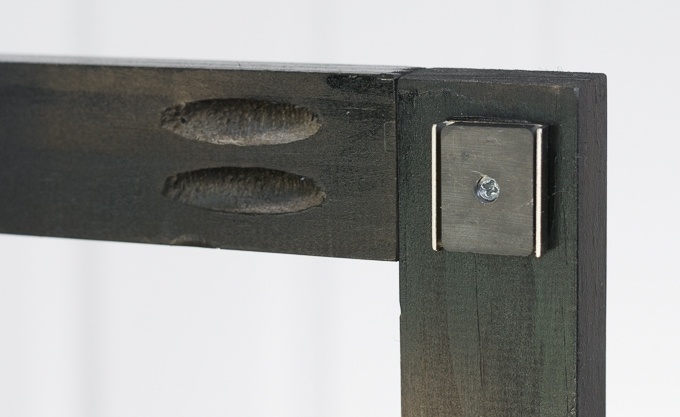 Use your drill and a drill bit that is about the same size as your dowels to drill holes where each of the marks are. Make sure you don’t drill all the way through! 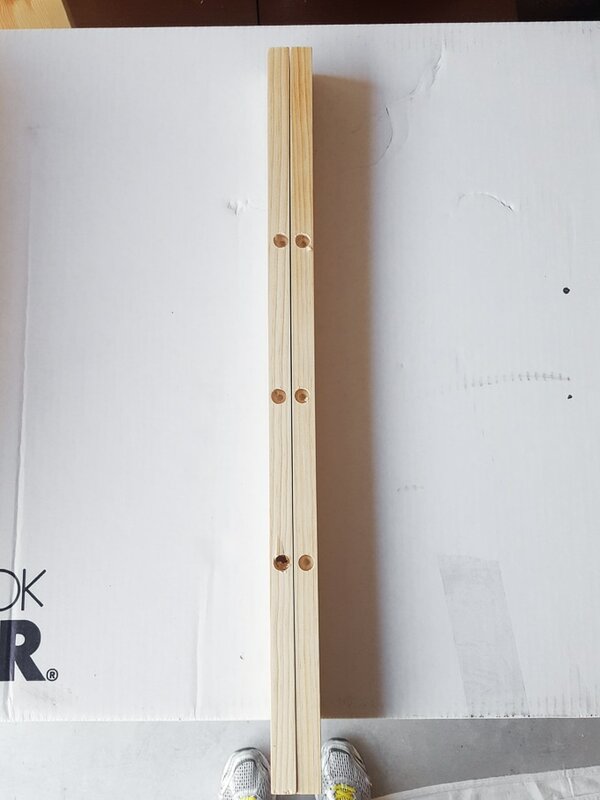 Step 3: Use your Kregjig to drill two pocket holes in each end of the 21″ 1×2 pieces. 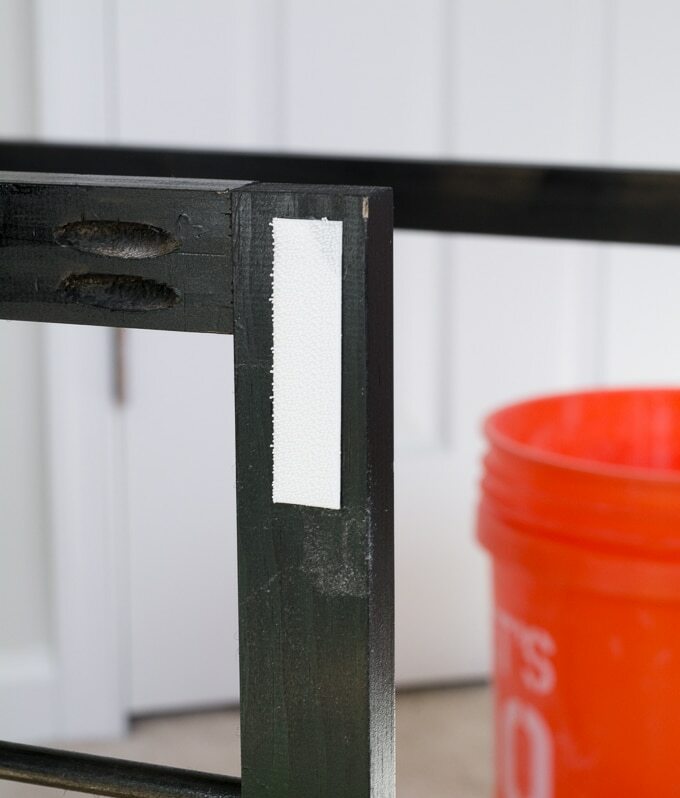 Step 5: Dab a bit of wood glue into the dowel holes you drilled and pop the dowels in. If it’s a tight fit, you can use a rubber mallet to get them in there. 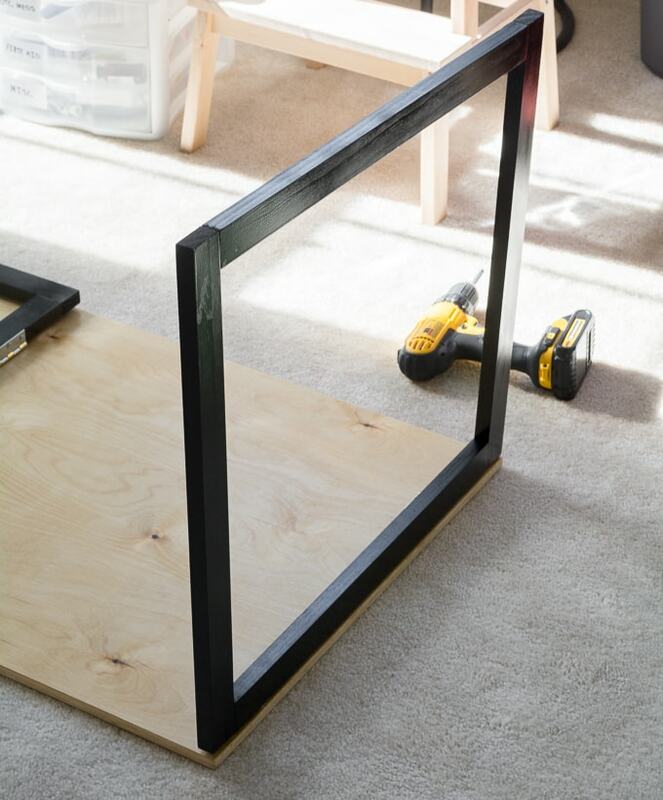 Then use pocket hole screws to attach the other 24″ piece to complete this rack. Step 6: The hard part is over—the bottom rack for drying sweaters is easier! 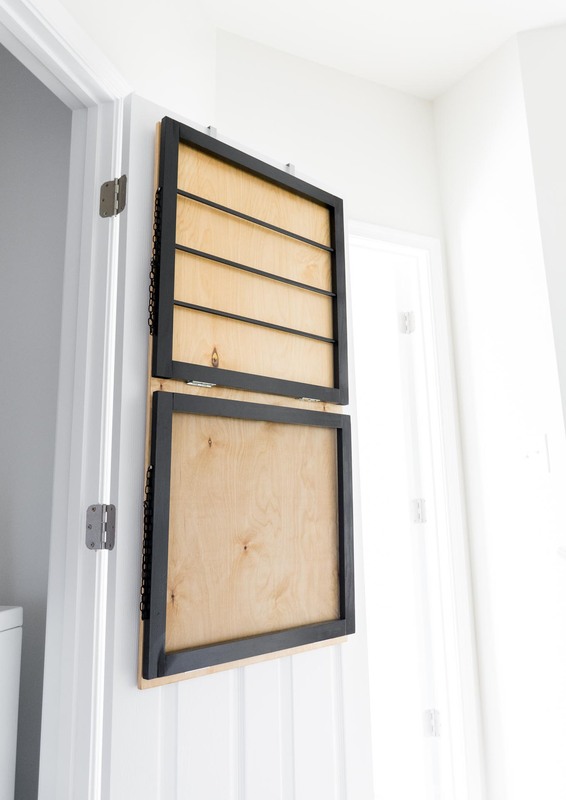 Using pocket hole screws, attach the (2) 24″ pieces to the (2) 22″ pieces to form a square. 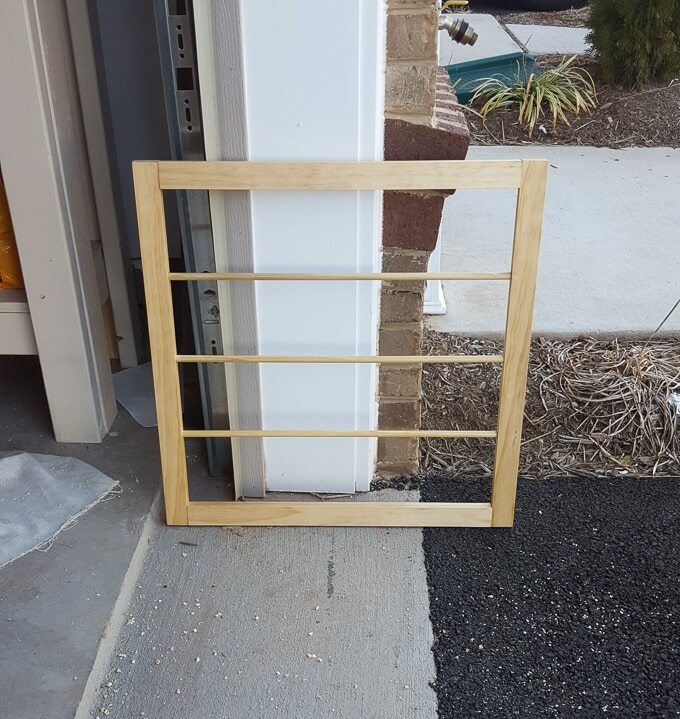 Step 1: Now that everything is assembled, it’s time to paint and stain. 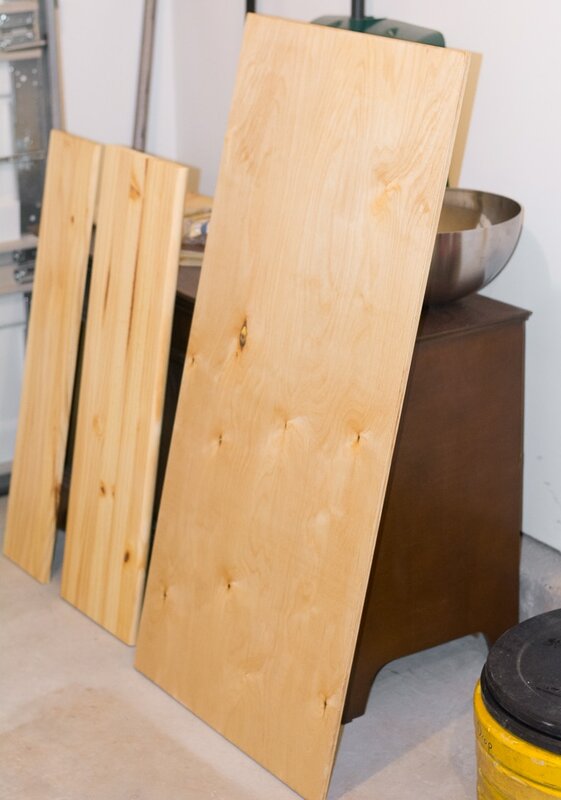 You’ll be working with all three pieces: the two racks you made in part 1, as well as the plywood backer. If you haven’t already done so, sand your piece of plywood. Then clean it off and stain or paint it. I stained mine using Minwax Natural and two coats of polyurethane in semigloss. Here it is drying on the right. 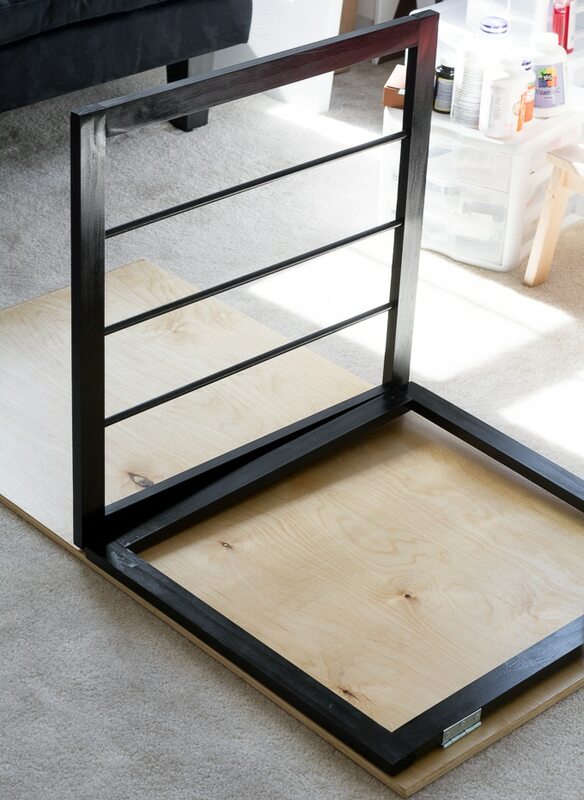 Step 2: Paint or stain your two racks. I chose to paint mine using Valspar black spray paint in gloss. I love the contrast of the black against the light pine! 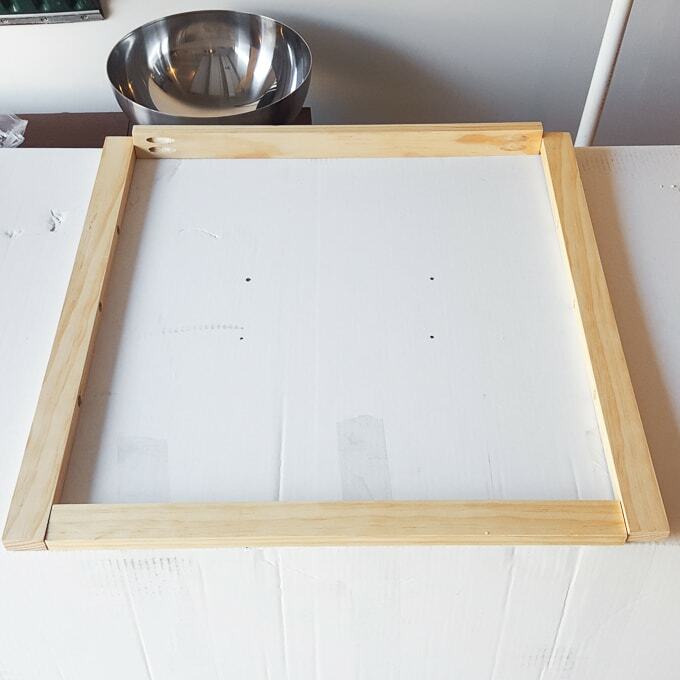 Step 1: Attach the rack with dowels to the top of the plywood backing using (2) narrow hinges. Then, attach the sweater drying portion below it. 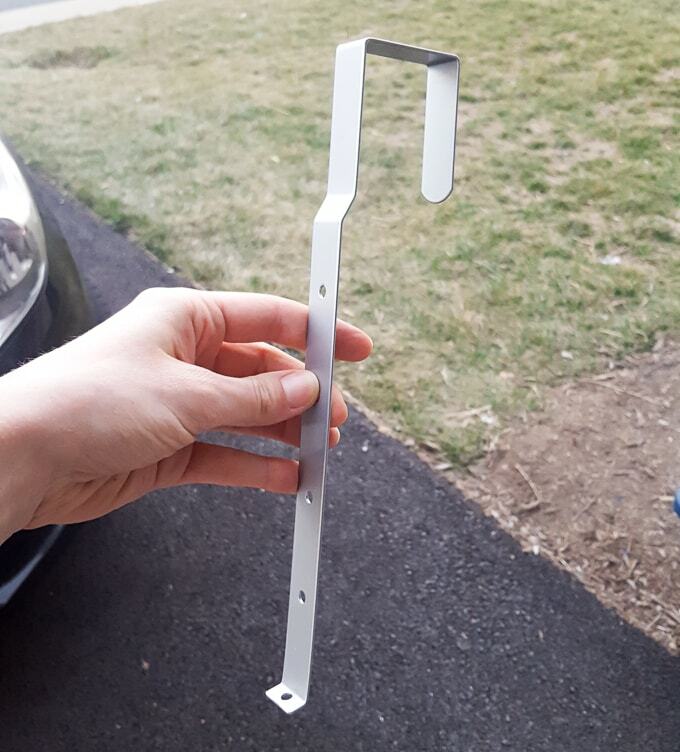 The hinges are what will allow the racks to fold down and back up. I used Loctite on the backs of the picture-hanging strips and magnets to ensure they stayed put. 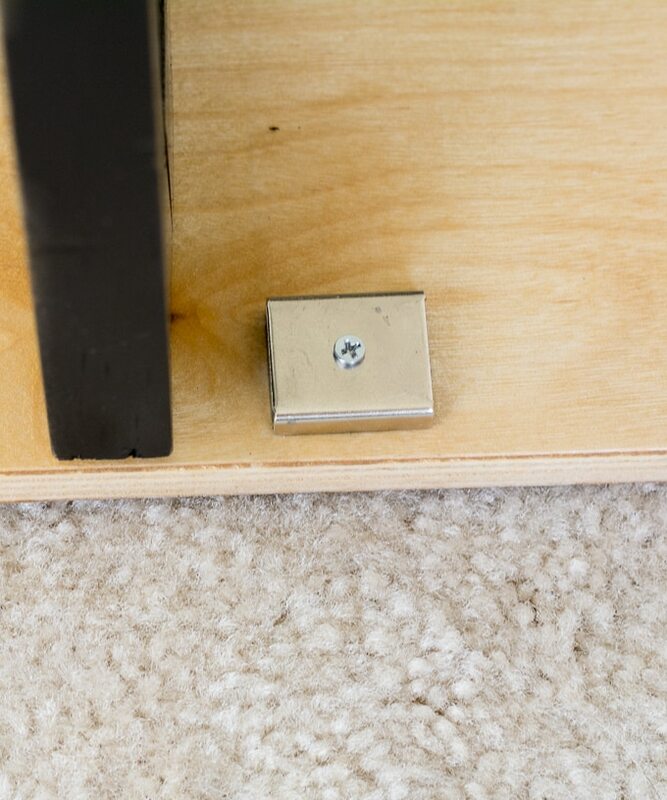 The magnets also have a nifty little screw hole. 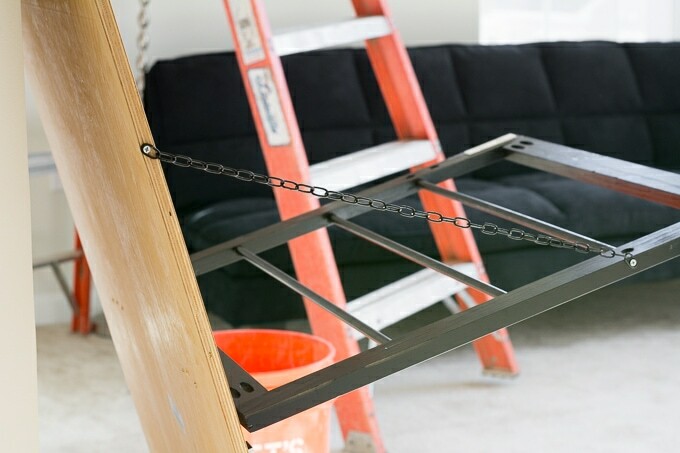 Step 3: To ensure that you’re not putting the full weight of the racks on the narrow hinges when you pull the racks down, you need to add a side support. 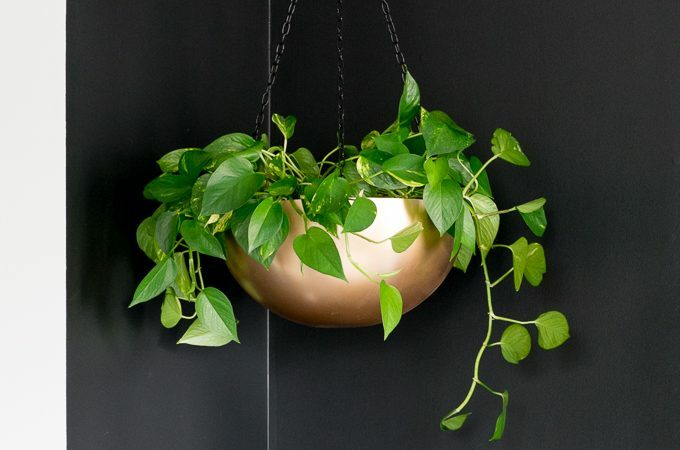 I used some black powder-coated chain I had left over from my DIY hanging planters project. Just drill it into place using screws. Step 4: Use fabric glue to glue a piece of tulle over the opening on the bottom sweater-drying portion of the rack. I used black tulle so it would blend in with the frame. The tulle will allow you to lay your sweaters or other delicate items out to dry while allowing them to get air from all sides. Instead, I opted to hang it over the door. After some Googling, I found this nifty little door hanger from Jo-Ann Fabric and Craft. I used a 60% off coupon and was able to bring it home for around $2. Perfect! 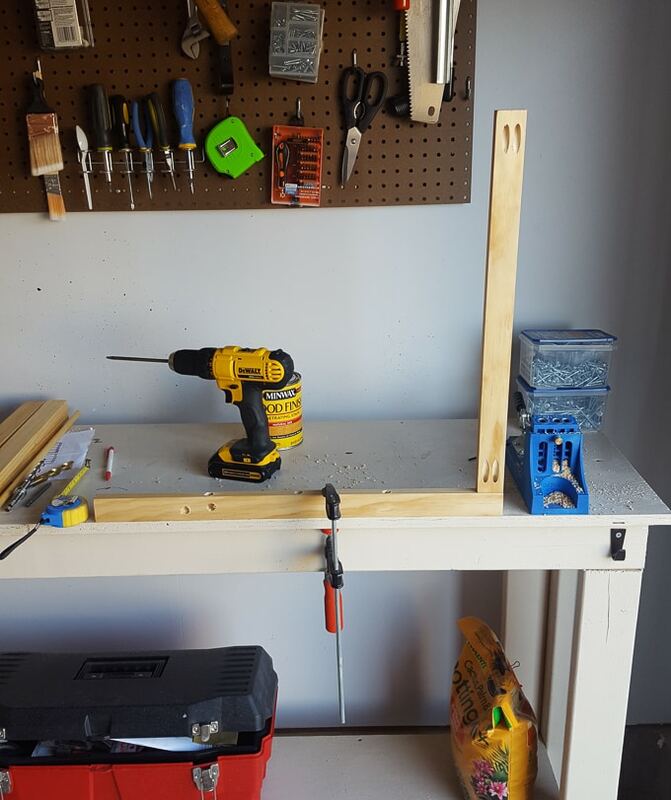 I just used the shortest wood screws I had to drill it into the back of the back of the drying rack. 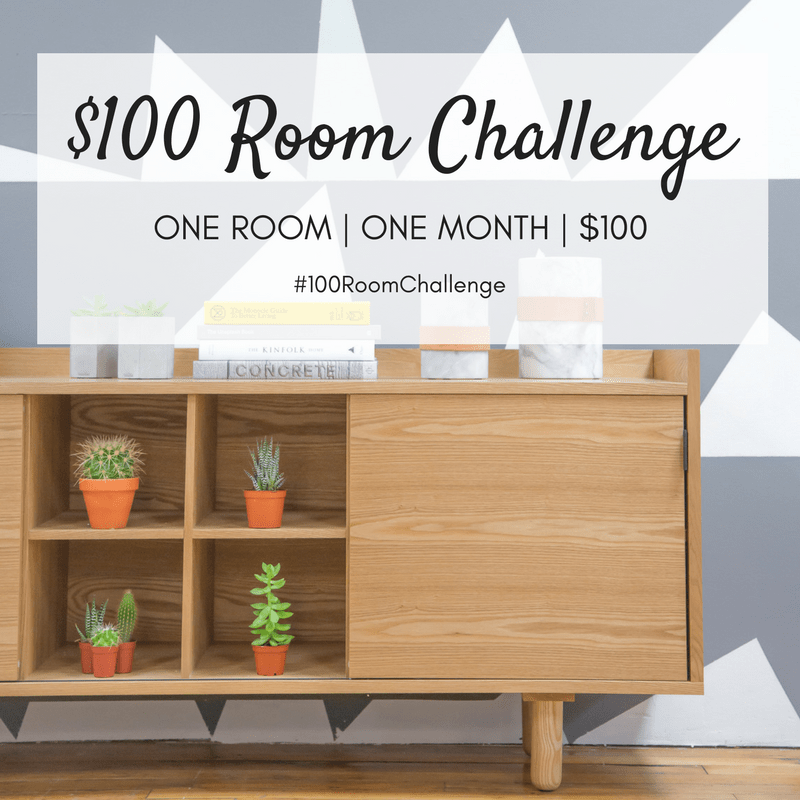 And make sure to check out the rest of the $100 Room Challenge Participants! This is AWESOME! Pinned for later for when (if!) 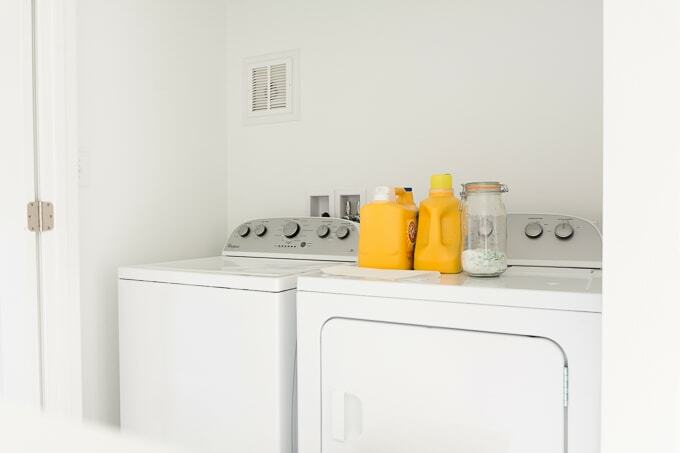 I ever get around to doing our laundry room! 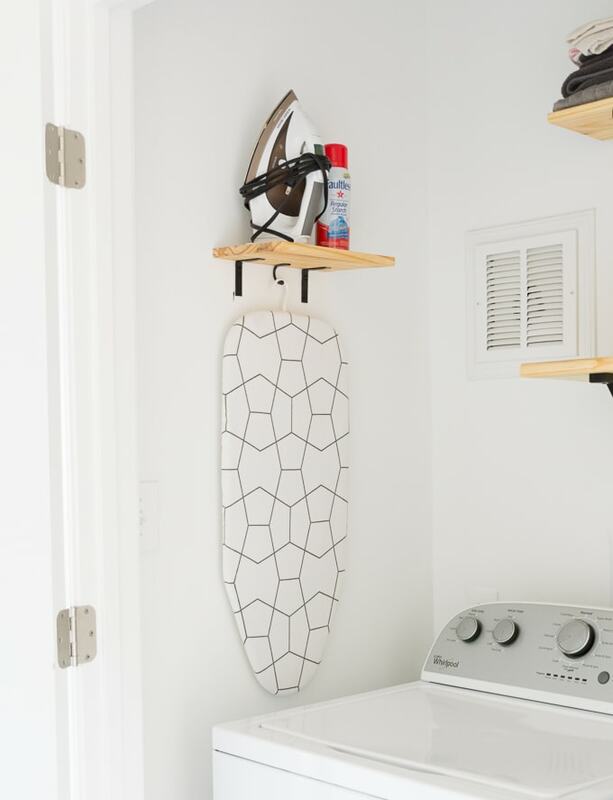 Wow – I think your drying rack is wonderful! My brain would not be able to make that happen. And the colors are great in that space, you wouldn’t be able to find the perfect size and color, so a DIY is perfect! Awesome job! This is a seriously sweet project! Love this! Seriously so cool! Such a great idea! I definitely need something like this in my laundry room! Great job on the drying rack! That is going to be very useful for you! Love it! this is so smart and turned out so nice! This is soooooo clever and it looks amazing!! I really need one of these for our bathroom. Love the light wood with the black! Amazing! So creative and it looks great! So cool!!! What a great idea! I *need* one of these drying racks! Thanks so much for the DIY inspiration and for the great tutorial. I can see why you were so excited when it was done! I love that it hangs over the door. This is such a fantastic tutorial Brittany! I need to make one of these, so clever!! Thanks Lisa! We love it! Wow Brittany such a clever DIY! I can’t wait to see it in the reveal! Love this DIY Brittany! The contrast between the black and light wood looks amazing! 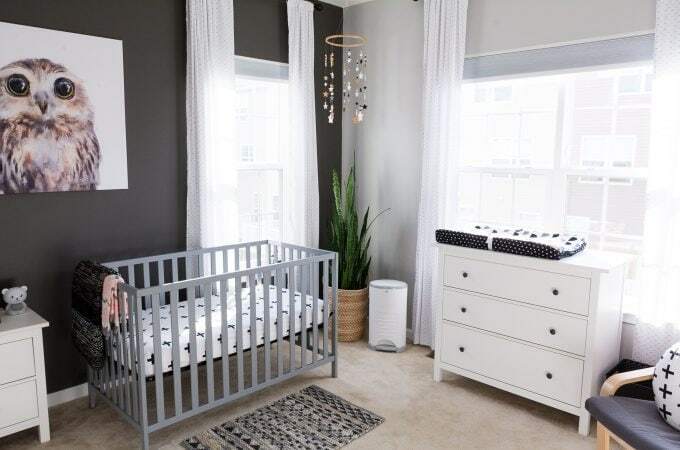 Cannot wait to see the full room reveal next week! I would love to do this in our new house! 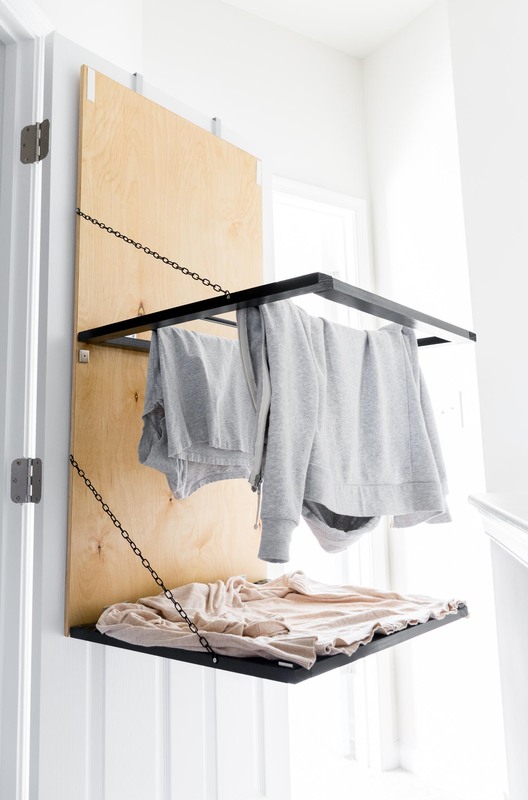 I don’t think we have much room to hang clothes, so this idea is perfect and space saving. Thank you!! Thank you thank you and thank you again. We needed a thorough tutorial of how to put one of these together. You helped me out immensely. We are about 80% finished a laundry room that we moved downstairs from a silly closet that didn’t fit the modern washers. 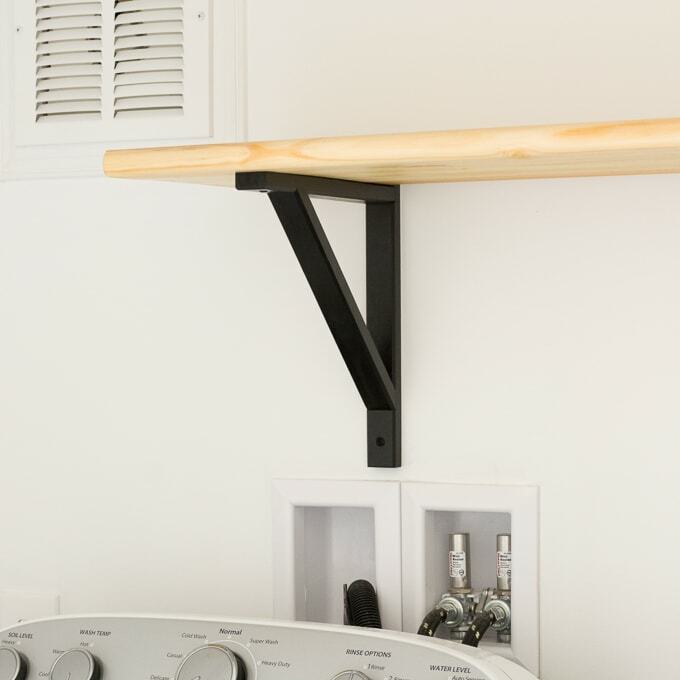 A rack and a shelf to hang the ironing board from are my two last wants. Pinning of course. Awesome to hear, Leanna! Good luck finishing up the room! I love your drying rack! I’d love to add one to my home’s laundry room! Great job. Brittany, this is awesome! 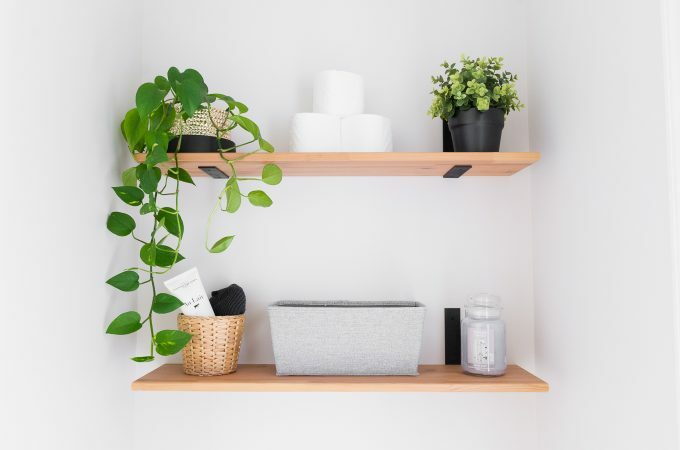 I need to make one of these four our laundry room too! Our old one just broke about a month ago, and I have to admit, it was about the second time I had used it since hanging it up on the wall. Haha! Thanks for sharing this with us at The Creative Circle Link Party! I’ll be featuring it on this week’s post!